Have I told you my sis cooks a mean Korean meal? She’s a better cook than me. I’m the lucky sister who gets to enjoy her food when I visit her. Wish she’s not so far away. 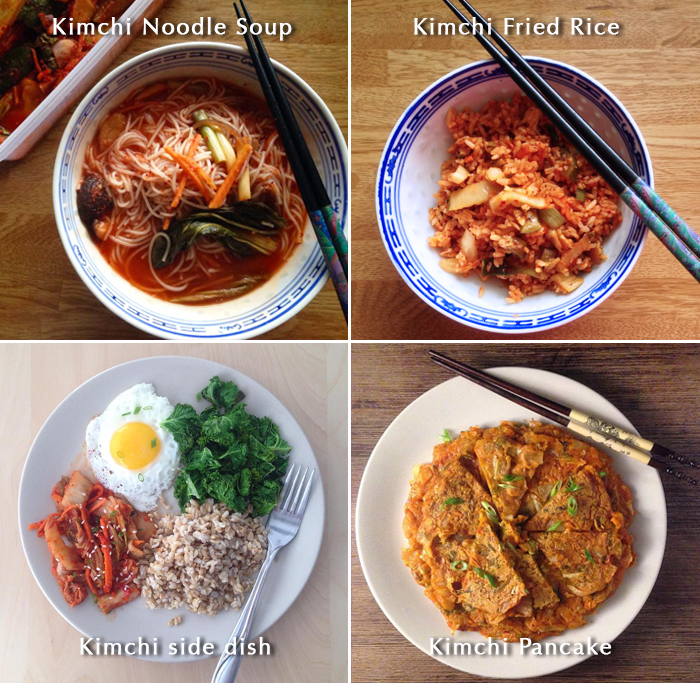 She’s the one who follows recipes to the T. She goes: “Do you know how much work that goes into Korean meals? 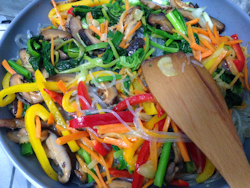 Most stir fry recipes (like Bimbimbap and Japchae) require each vegetable ingredient to be stir fried separately.” Like stir frying 5-6 different types of vegetable separately. I know, that’s why I love her to bits. I’m the one who simplifies and try to find short cuts. 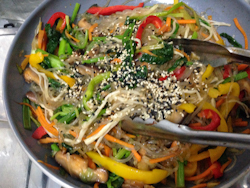 Japchae is a common dish found in a Korean restaurant menu. 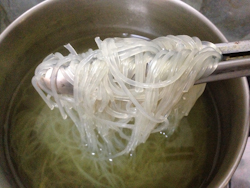 This sweet potato starch noodle (dangmyun) dish can be served as an appetizer, main meal alone or eaten with rice. This is not a difficult recipe, just require a bit more time. Not having my sis around, I tried my best to follow the cooking method but still ended with a little “cheat”. 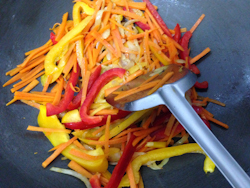 The actual method of cooking is to stir fry each vegetable separately, so you can get the temperature of the pan and texture of the vegetables right. I took a risk and stir fry 4 veggies at the same time. It’s true it takes an experienced cook to get the texture right together, which I have yet to master. But it still taste just as delish. 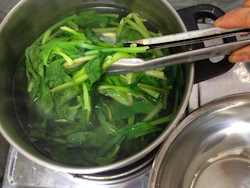 I served the noddles with 2 side dishes – Lettuce Salad and Spinach Banchan. I think my lil sis will be proud of me. Another method of cooking is without stir frying the noodles, usually served as side dish. Check out this method on Chow Divine’s recipe. P/S: I made this recipe this week for Fruits & Veggie Cleanse, substituting the noodles with kelp noodles and without soy sauce and honey. 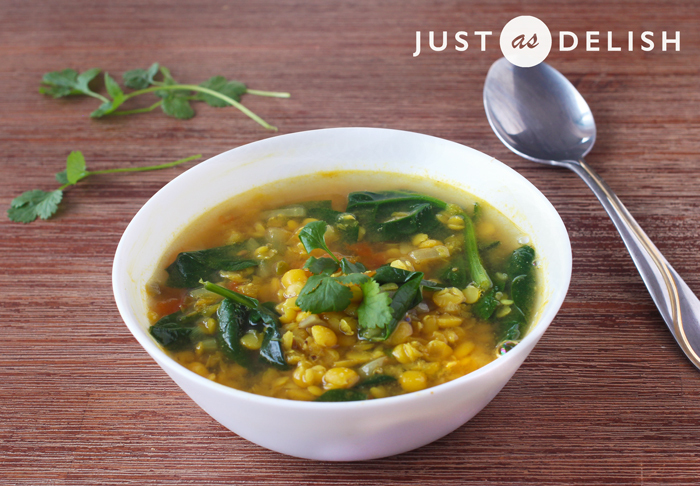 Bring water to boil in a medium pot and blanch spinach for 30secs. Remove with tongs / slotted spoon, reserve the hot water and rinse with cold water. 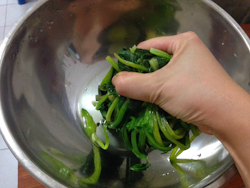 Squeeze out excess water using your hands. Add ½ of minced garlic and pinch of salt. Mix well. Set aside. 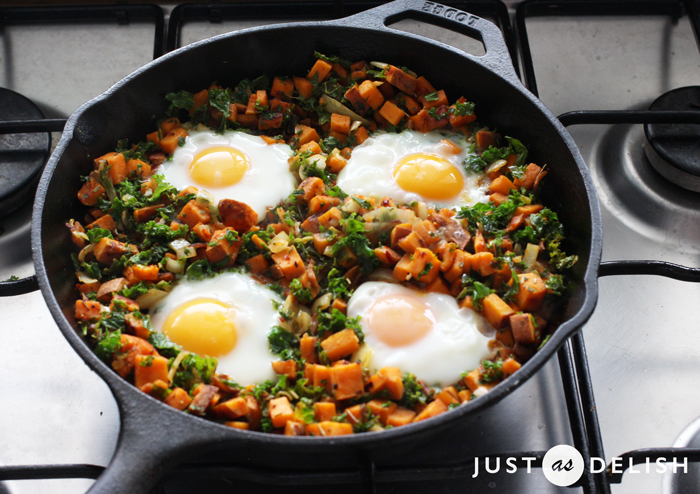 After removing the spinach, immediately transfer the sweet potato noodles to the pot while the water is still piping hot. Let it sit for 15 minutes. Meanwhile, heat a pan over medium-high heat. Add grapeseed oil to coat the pan. Add onions, stir-fry for a minute; add in carrots, stir-fry for another minute; finally, put in bell peppers and stir-fry for another minute or two. You want the bell peppers to maintain their color and crispness. Add a pinch of salt and set aside. With the same pan on medium high heat, add oil, sliced shiitake mushrooms and ½ of minced garlic. Stir-fry until the mushrooms are lightly brown. Add green onions, teaspoon of soy sauce and 1 teaspoon of honey. Stir-fry for a few more seconds until the liquid (soy sauce) is absorbed and the green onions just start to soften. 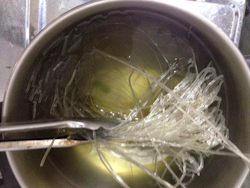 After 15 minutes of soaking, the noodles should look translucent. Taste to make sure it is fairly soft and chewy, like al dente pasta. Strain and rinse with cold water. Drain dry. 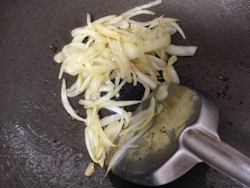 Heat a non-stick pan or a wok with 1 tablespoon oil over medium heat. (If you are using normal pan, make sure it is well coated with oil or the noodles will stick to the pan). Add noodles to the pan and stir to coat with oil. Stir-fry for about a minute; you want the noodles to maintain some chewy texture. 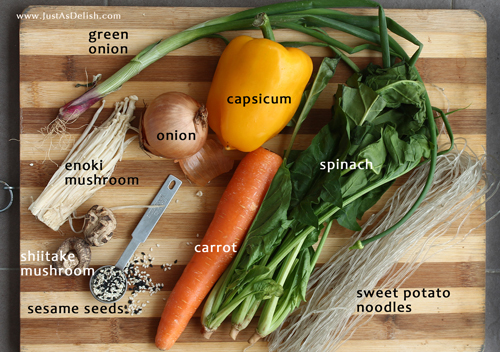 Add reserved vegetables, and mix well. Mix 3 tablespoon soy sauce, 1 tablespoon honey and 1 tablespoon sesame oil in a bowl and add into the pan. 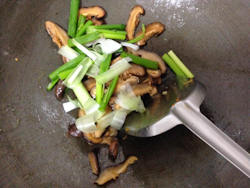 Add enoki mushrooms, mix well to be heated through and switch of fire/remove pan from heat. 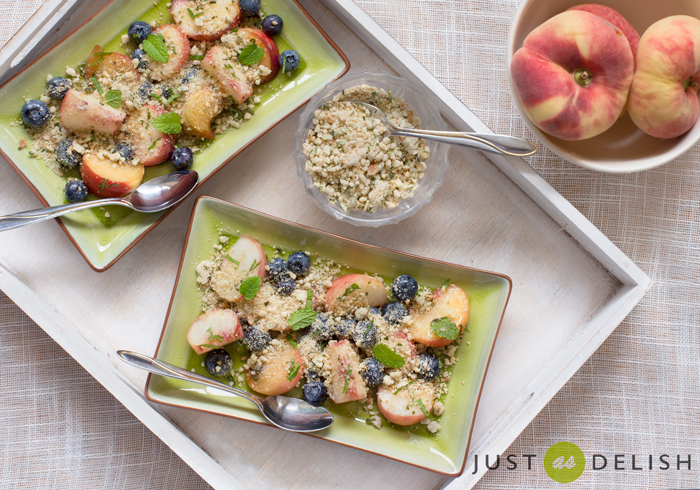 Garnish with sesame seeds and serve immediately it as a main meal or over steamed rice. 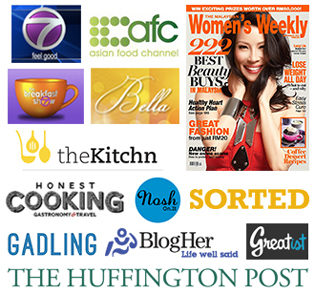 * Recipe revised and updated, from first publication on 26 April 2014. Hi, again. I am Korean. So your posting about japchae caught my attention. Nice one! What an absolutely gorgeous noodle bowl! Healthy and beautiful! This has come at just the right time. Incredibly, having never heard of sweet potato starch noodles previously I ordered some just two days ago! It should be here soon and I know just the thing to make with it. This is absolutely perfect, Shannon. And I agree about shortcuts, although I wish I had a sis who could cook like yours. Lucky you! Korean sweet potato noodles are my absolute number one in the noodles’ world! 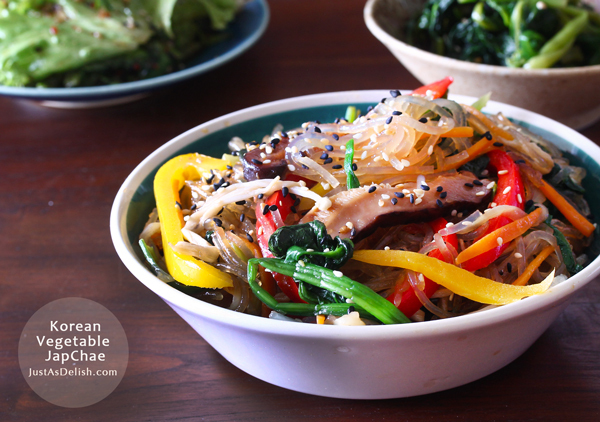 Your japchae looks delicious. 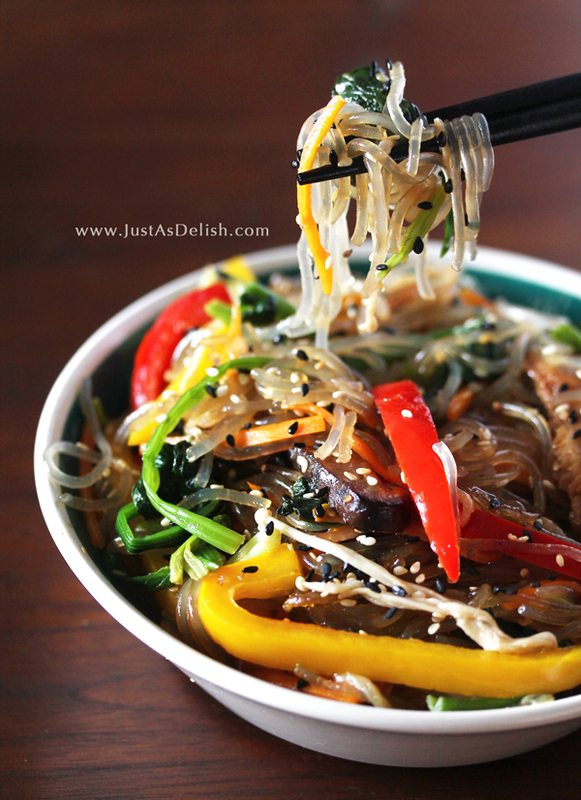 I should do japchae one day because I always stir-fry these noodles my way (with dark Chinese soy sauce… not a very traditional Korean thing to do 😉 ).